Use this guide to understand common vulnerabilities in Cloud Firestore Security Rules configurations, review and better secure your own rules, and test your changes before deploying them. If you receive an alert that your Cloud Firestore database isn't properly secured, you can resolve the vulnerabilities by modifying and testing your Cloud Firestore Security Rules. To view your existing Security Rules, go to the Rules tab in the Firebase console. Note: If you manage your Security Rules from the Firebase CLI, go to the rules file noted in your firebase.json file. Cloud Firestore Security Rules protect your data from malicious users. The default rules for any Cloud Firestore instance created in the Firebase console deny access to all users. To develop your app and access your database, you'll need to modify those rules and might consider granting blanket access to all users in a development environment. Before deploying your app to a production environment, however, take the time to properly configure your rules and secure your data. As you're developing your app and testing different configurations for your rules, use the Cloud Firestore emulator to run your app in a local development environment. The Cloud Firestore Security Rules you might have set up by default or as you initially worked on developing your app with Cloud Firestore should be reviewed and updated before you deploy your app. Make sure you properly secure your users' data by avoiding the following common pitfalls. As you set up Cloud Firestore, you might have set your rules to allow open access during development. You might think you're the only person using your app, but if you've deployed it, it's available on the internet. If you're not authenticating users and configuring security rules, then anyone who guesses your project ID can steal, modify, or delete the data. Not recommended: Read and write access to all users. // anyone to overwrite your entire database. Solution: Rules that restrict read and write access. Build rules that make sense for your data hierarchy. One of the common solutions to this insecurity is user-based security with Firebase Authentication. Learn more about authenticating users with rules. Sometimes, Cloud Firestore Security Rules check that a user is logged in, but don't further restrict access based on that authentication. If one of your rules includes auth != null, confirm that you want any logged-in user to have access to the data. Not recommended: Any logged-in user has read and write access to your entire database. Solution: Narrow access using security conditions. When you're checking for authentication, you might also want to use one of the authentication properties to further restrict access to specific users for specific data sets. Learn more about adding security conditions and role-based access. allow read: if get(/databases/$(database)/documents/users/$(request.auth.uid)).data.role == "Reader"
allow write: if get(/databases/$(database)/documents/users/$(request.auth.uid)).data.role == "Writer"
// above) or `exists` carry standard charges for read operations. 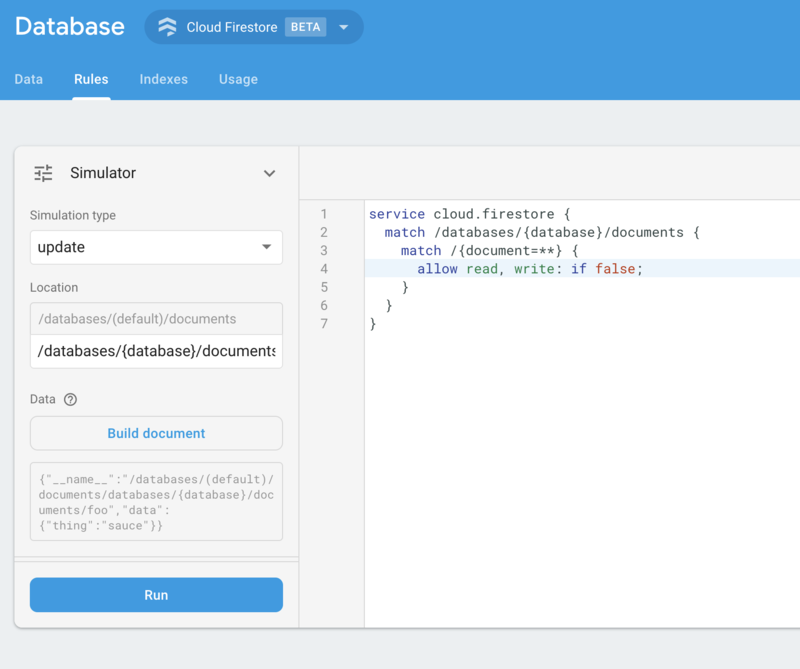 The Firebase Admin SDKs and Cloud Functions can still access your database. Use these rules when you intend to use Cloud Firestore as a server-only backend in conjunction with the Firebase Admin SDK. While it is secure, you should test that your app's clients can properly retrieve data. Learn more about Cloud Firestore Security Rules and how they work in Get Started with Cloud Firestore Security Rules. To check your app's behavior and verify your Cloud Firestore Security Rules configurations, use the Cloud Firestore emulator. Use the Cloud Firestore emulator to run and automate unit tests in a local environment before you deploy any changes. To quickly test your updated Cloud Firestore Security Rules in the Firebase console, use the Simulator tool.